Horror in which a clinical trial at a remote facility goes terribly wrong. Among those who sign up to test ProSyntrex's latest drug Pro9 are Adam (Aneurin Barnard), Joni (Alex Reid), Carmen (Skye Lourie) and Jed (Oliver Coleman). The trial is highly secret, with no-one, including the staff who administer injections, aware of who is receiving the drug and who is in the placebo group. Shortly after the trial begins it becomes clear that something has gone wrong. There are unexplained disappearances, bizarre silhouettes and screaming from behind locked doors. 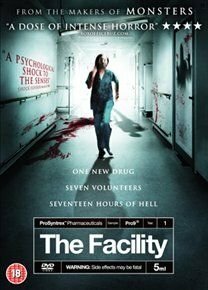 Locked inside the facility, unaware of the true nature of events, the surviving patients and staff must band together to try and find a way out of the nightmare.